Hope you’re having fun ripping it up in the jungle on Pacific Rift because starting this Thursday, May 14th, we’ll be sending a downloadable vehicle livery pack your way every week for the next eight weeks exclusively via PlayStation Store. 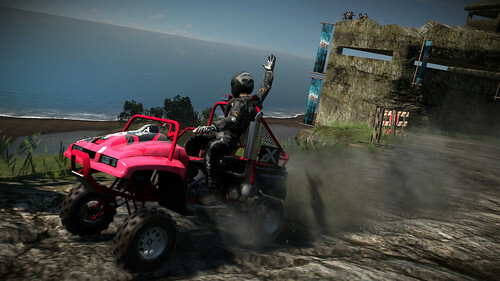 Each pack features new paint jobs for three vehicles, and the full set will give MotorStorm: Pacific Rift players a cutting-edge new look for every single vehicle class in the game: Mudpluggers, Quad Bikes, Monster Trucks, Rally Cars and more. Each new livery has been designed by one of Evolution’s top studio artists and the result is a collection of some of the craziest and out-there vehicle sprays ever seen in a racing game! And to top it off, all these liveries are FREE! Actually, wanted to focus on these new Microbadges as these are very cool ways of giving each player a distinct identity when online in MotorStorm Pacific Rift. Microbadges are in-game displayable ‘medals’ which let you flaunt your proudest personal accomplishments and your off-road racing prowess to every other racer online. Microbadges are displayed beneath each Online ID, and players can display up to three badges from the get-go. Three more badge slots (there are six slots total) can be earned by working up the online ranks, and players can unlock 40 microbadges total. Players can choose which badges to show off and highlight what they’ve achieved in the game. Microbadges will also provide retroactive credit, so if you’ve already put in the hours, you’ll be reaping the rewards. Last but not least, we wanted to give you a heads up on the photo contest we highlighted earlier. Well we have finally gotten our winners, and they will be officially announced later this week on the official MotorStorm VIP site: vip.motorstorm.com. Keep an eye out to see if you are one of the lucky winners! Free DLC rocks, more companies should do this! Can we expect to see more DLC for MotorStorm: PR? I bought this game on the promise that it would support like the first MotorStorm. So far, you guys haven’t been doing a very good job. No new vehicles nor tracks. Stay tuned, TakiFuGu. We\’ll have more info on that coming soon. Wow, this game is so awesome. Seeing support like this always goes to show you which companies really care about the fans! You guys are doing this thing right. I appreciate all of your hard work into this series. MotorStorm is still one of the best racing games out there, on any console! Thank you very much for FREE DLC – any DLC is awesome as long as it enhances and brings more to an already great game! I appreciate the free vehicles paint jobs. However I have to admit when I saw the letters DLC in the title of this post I got really excited for something more substantial, MORE TRACKS. Ive been wondering when some DLC was coming for this game seeing as how its been out for like 7+ months now? Anyway any chance will be seeing some new tracks or perhaps whole new festival around E3 time? Or without confirming something your not supposed to what kind of time frame are we looking at to wait for some more substantial DLC? Here’s to hoping that you guys really stick to the free upcoming DLC as promised. sweet! i needed a reason to pick this game up again. I’d really like to see the price come down on MS:PR just a little bit. I liked Motorstorm and have always meant to pick up Pacific Rift, I just keep getting deterred by seeing it at $70+ CDN. If the price isn’t slashed soon I’m getting it used. GREAT some free DLC, following Burnout with free DLC. Only problem is I completed the game with al Gold medals. Today played a match online and my Save file corrupted now i have lost everything. The 40 Hours+ i put into the game is now for nothing. I’d gladly buy it if it supported my Logitech Driving Force GT wheel. Nice avatar and last name. I like free! Is this for all region versions? What would boost the appeal of this game 1000% would be the addition of a a livery editor so that players could customise their own paint jobs. It’s available in other racing games and would add great value to what I feel has been a poorly marketed and under appreciated game. Thank you sooo much for this update! I can’t believe any gaming company would release free DLC like this one. This is great news and thank you for all the effort you put into it. I can’t wait to check it out! Awesome news! Thank you so much! Just downloaded the new update last night and I’ve got to say the game play seems better and quicker than before. Sure love the free DLC that’s coming our way. MS Pacific Rift is a great game for those of you that haven’t purchased it yet. …and Kudos to Evolution Studios for making it! Awesome, glad to see this great game getting some support. I hope you guys release a weekend festival expansion or something soon. Also those badges are a very cool idea. Great praise from a true gamer. Listen to norm01, people… he\’s on to something. 12-player online multiplayer and 4-player split screen action? Where does the fun stop? Good decision to provide skins as free DLC. It’s a low cost way of supporting the title, can look quite cool and is generally appreciated by fans. Hey Capcom, are you paying attention?? I didn’t know the game before buying it in a PS3 pack. It’s a great game, on line mode is cool. Thanks for the updates. Free nice! I just got the game a month ago so I guess I got it at the right time. Just got done with Festival yesterday. Really great game. I know a bunch of people on the forums hate you but I dig you! You dig? Wish for more modes though and/or maps. Very nice been a fan of motorstorm since i bought my 80gig motorstorm bundle PS3. Keep up the good work and ill support until the end! Any chance we can get driving wheel support? Wish i could play sadly i came home to India for my vacation and after i came home wen i wanted to play some motorstorm, i opened my bags to find out that the games were stolen from my baggage after it came out of the plane and before it came to me and to make it worse the games were Motorstorm:PR, Killzone 2, LBP, GTA4, Bioshock and my Quantum Of Solace Bluray. I am very sad but will be able to play again only after i come back to the US. Anyway good work guys. Nice! Although I must admit that I like the original MotorStorm much better… I think it’s the controls of the vehicles in Pacific Rift… they seem… off. An island or Monument Valley? Let’s just try! I cannot believe I still have not bought this wonderful game. Are there new Trophies coming with this update? I don’t know if Sony is still allowing free DLC to provide extra Trophies (I remember Burnout Paradise doing it, but it was a long time ago). Either way, kudos to you! Cool…Ive been looking to get back into MS:PR online..last time a played it took a while to find a match in matchmaking…is there still a good community? I like the microbadges idea…very cool. Thanks for answering my first question. Wouldn’t have been best to start rolling out the DLC for MotorStorm: PR earlier? I’m just asking, because I noticed the momentum for the game has slowed down tremendously. Though I do enjoy the game. The leveling process is extremely annoying. I’m only missing 2 more Trophies to platinum the game. At my level, during a race if I don’t come in 1st or 3rd. The level meter barely moves. If I happen to have a bad race and come in 7th or 8th. It drops sooooo much. Its so frustrating.